This article explains in detail how to set up a small network at home so you can share your Internet connection between two computers running Windows XP. Connect the first one of your computers (the server) to the Internet and test the connection to make sure that it is working properly. Then click Start > Control Panel > double click Network Connections > right click the Internet connection and select Properties. 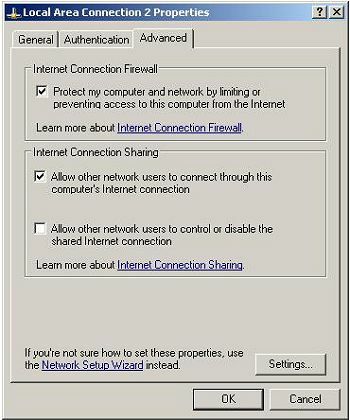 Click the Advanced tab and check the Allow other network users to connect trough this computer's Internet connection. Leave the option Allow other users to control or disable the shared Internet connection unchecked or checked depending on your preferences. Click OK. In order to share your Internet connection you need to network your main computer (the server) with your other computer (the client) - this can be done with cross-over cable connecting the two PCs' network cards.